St. Michael Catholic Cemetery exists to carry out the sacred task of burial and care for the resting places of our deceased brothers and sisters in Christ . We accept this responsibility under the direction and supervision of the Archdiocese of Detroit. We are committed to adhere to the rich tradition of the Catholic Church with regard to the deceased and the sacredness of St. Michael Cemetery in which their bodies rest. We recognize the significance of the Corporal Work of Mercy involved in the burial of our loved ones. We are dedicated to the respectful care of the grounds where the people of God rest. We recognize in death they remain a part of our Christian family. We encourage Catholic prayer and devotion for the deceased interred in St. Michael Cemetery and their families. We proclaim through our words and example the sacredness of the human body and our firm belief in a bodily resurrection. Michael Schindler donated this property to St Augustine Parish in 1889 to be used as a cemetery. Hence we have the name St. Michael Cemetery. In 1920 the parish purchased another piece of property to enlarge the cemetery. In 1965 Thaddeus Swartz and his wife donated an additional 3.5 ajacent acres. This donation almost doubled the size of the cemetery to its present (roughly) 7 acres. During the time that Fr. Kreucher was Pastor, in 1974, a drainage system and paved roads were added improvements. A Chapel was erected in 1978. In 2004 a columbarium suitable for the burial of cremains was donated by the Richmond Knights of Columbus Council 2667. In 1995 St. Augustine’s began a special annual collection for the care of St. Michael Cemetery. Each year around Memorial Day there is an envelope in our regular packet of envelopes for donations for the upkeep and future care of the cemetery. Our cemetery committee meets once each quarter to oversee the usage and care of the grounds. They also continue to plan for the long-range perpetual care of the cemetery. We have reciently aquired an additional 9 acres which now connects the cemetery with a 5 acre parcel on 31 Mile Rd. Developing this land will take some time and money, but the long range viability of the St Michael Cemetery looks promising indeed. Ever since the sacred body of our Crucified Savior was placed reverently in the tomb to wait the hour of its glorious Resurrection, the Church has been most solicitous to surround the burial of those who hope to rise with Christ with an atmosphere of deep Christian faith and profound reverence. In the Mass and burial prayers, the Church gives voice to her belief in the Christian doctrines of the Resurrection of the Body, the Communion of Saints, and Life Everlasting. As a further seal and symbol of that faith she sets apart and solemnly dedicates the place in which the bodies of her faithful departed await Resurrection. In the very earliest days, the Catholic Church found it necessary to make rules and regulations which would protect these sacred places. She could not and would not allow anything within the holy precincts which would desecrate them, lessen their beauty, or bring dishonor on the dead. Since beauty is indeed in the eye of the beholder and one persons trash is another&apos;s treasure, it has fallen to St. Michael&apos;s Cemetery Committee to set down some practical guidelines. In accord with the mind and traditional practice of the Church and to establish and maintain the good order of St. Michael Cemetery, the following rules and regulations are in effect. Sooner or later every cemetery will fill to capacity. When this happens there must be (by law) a perpetual fund in place to pay for the maintenance, repairs and upkeep of the cemetery from that point on. To help assure this fund, we are obliged to exercise fiscal responsibility and must make every effort to keep present day operating and maintenance costs within reason. To that end St. Michael Cemetery Committee must begin to enforce the following (longstanding) rules. For the mutual protection and benefit of visitors, workers and burial right holders in the cemetery of St. Michael, the management hereby adopts the following rules and regulations. All burial right holders, persons within the cemetery and all grave sites shall be subject to these rules and regulations and such future amendments or alterations or additions as adopted by the St. Michael Cemetery Committee of St. Augustine Parish. St. Michael Cemetery is intended for the interment of Christians who are entitled to Catholic burial according to the rules and discipline of the Roman Catholic Church as set forth by the Archdiocese of Detroit. The "Certificate of Right of Burial" grants only the right or privilege of burial and not title or deed or any other interests in or to the land itself. No coping, curbing, fencing, hedging, edging, borders or enclosures of any kind shall be allowed around the grave or burial site. The Management reserves the right without prior notice to remove the same if so erected, planted or placed. Neither St. Michael Cemetery management nor any of its employees sell or direct inquirers as to where to purchase monuments, markers or headstones. However, all such monuments, markers and headstones must be approved before being placed in the cemetery. Visitors are not permitted to bring animals into the cemetery or into any buildings in the cemetery. The only exception being animals trained to aid the physically imparied. In-ground planting of annuals touching the front of the monument and extending no more than twelve (12) inches out from the front of the monument is allowed. Annuals may also be planted in pots, which are then to be up off the ground hung from a shepherd’s hook or other like stand of wrought iron. The shepherd’s hook should be placed touching the front or side of the monument so as not to hinder ordinary maintenance of the cemetery. There shall be no planting of perennials, shrubs, trees, and/or any other live materials. All such plants will be removed. Only clay, fiber glass or plastic pots not exceeding 10 inches in diameter and no more than 6 inches high and rustic baskets with handles not to exceed 12 inches in diameter will be permitted for potted plants. Only one pot or one rustic basket will be allowed per grave site. All flowerpots must be removed by November 15. 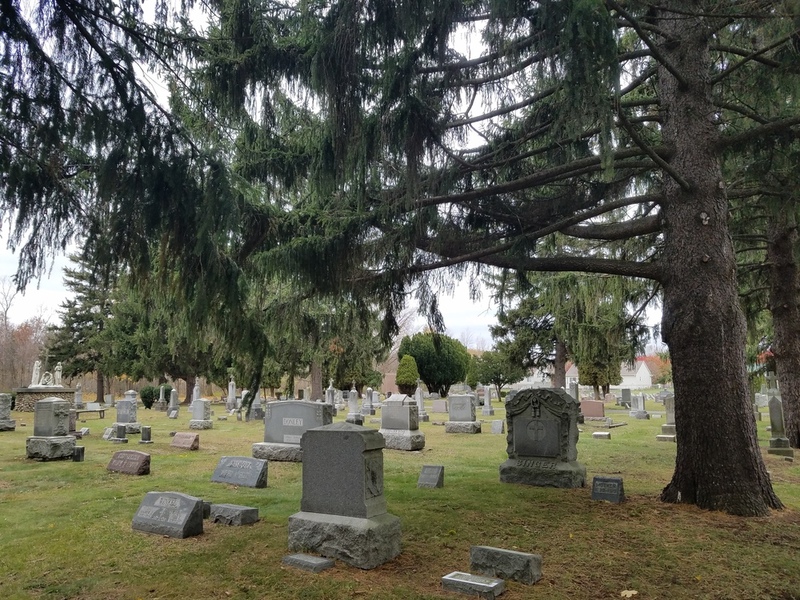 During the winter months live wreaths, evergreen blankets and artificial decorations which are in keeping with the nature of a Catholic Cemetery are permitted between November 15 and April 1st. Families are responsible for removing all winter artificial decorations by April 1st. Articles such as glass of any description, any statuary, plaques, vases, water cans, food tins, wood or iron cases or decorations, cardboard containers, ornaments or bric‑a‑brac of any description are not allowed and will be removed by maintenance personnel. St. Michael Cemetery shall not be liable for vases, floral pieces, and baskets of flowers, beyond acceptance of such floral pieces for the funeral service in the cemetery. All floral pieces will be removed the day following the interment/entombment service. Persons desiring to retain memorials should remove them immediately following the graveside service. The placing of rocks, crushed stone, wood chips, shells, etc. on graves is strictly prohibited. These items will be removed disposed of without notice. 1. Memorial dealers shall abide by all rules and regulations of St. Michael&apos;s Cemetery. 2. The Management reserves the right at all times to approve and prescribe the kind, size, design, symbolism, craftsmanship, quality and material of memorials, inscriptions, monuments, or markers placed or to be placed in the cemetery. All memorials are subject to the approval of the management prior to the placement. Said detailed regulations and instructions and all amendments hereto are hereby made a part of these rules and regulations. 3. Management reserves the right to fix the days and hours when any memorial may be delivered to the cemetery. Call to make arrangements. 4. All memorial work including the placement or removal of any memorial shall be on the written order of the grave holder. 5. Independent monument dealers or contractors who build memorial foundations are required to comply with specifications and directions established by management. 6. The location and position in which a memorial is to be placed or erected on a grave shall be entirely subject to the approval and under the supervision of the management. 1. The term MONUMENT shall include a tablet, headstone, tombstone, and niche of granite, marble or bronze, which shall extend no more than 36 (thirty-six) inches above the ground. The term MARKER shall include a tablet, headstone and tombstone, which is flush with the ground. All monuments and markers must have a foundation, installed by personnel approved by the cemetery management. 2. ALL MONUMENTS AND MARKERS must be of granite, marble or bronze. Only one above-ground monument is allowed per grave site. 3. PREDOMINATE CARVINGS, INSCRIPTIONS, EPITAPHS, must be of a religious nature and must be approved by the cemetery management prior to ordering and installation. Names placed on monuments and markers must match cemetery records. Visiting hours are: ½ hour after dawn to ½ hour before dusk 365 days a year. Please remove any decorations from the graves you wish to keep. All Veteran flags placed on the graves last year will be removed. New flags will be placed on graves prior to Memorial Day.